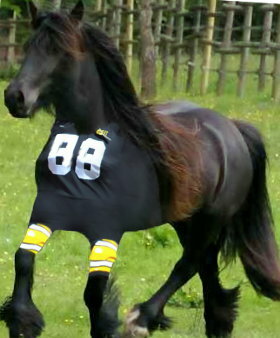 Who Wants To Play Horse Football? There are lots of games and team sports you can play on horseback – everything from the classic game of polo to simple chase games. Why then, don’t we have a proper horse football league yet? It would work. Horses would love to play, and it would be a great game to watch too. It would also be safer than polo which involves a lot of swinging dangerous looking sticks and very hard balls flying at a hundred miles per hour. But with horse football you could use a ball similar to a regular soccer ball, but just make it bigger. Or maybe something like one of these indestructible footballs. Then make the goals wider too so it’s not impossible to score, and you’ve got a great game. It would work just the same way as a normal football game. With riders of course – I don’t think the horses would just happily play all on their own, I’m not quite that silly. I’d certainly love to play, and ride in a game. Spectators would love the game too I think, because it would be quite fast and exciting. Like all sports it would depend on the skills of the riders – expert games would be faster and more skilfull. Can you imagine though how much people would enjoy betting on the game too? Because not only do we have horses which people bet on all the time in races, but we also have football, and people bet on that game all the time too (although it works a bit differently and can be a little bit confusing). Put the two things together and you’ve got double excitement for the spectators. It would be a little tricky to teach your horse how to dribble and kick the ball – you’d need to polish up on those essential riding skills, but I think you could do most of the work with just a simple canter and let the horse just naturally run in to it rather than actual kicking. There wouldn’t be much tackling but there are plenty of games, like netball, where you don’t tackle at all. Or ice hockey where it’s so fast that there isn’t much tackling anyway. I wonder if the regular Premier League would like to help me out..? Learning to ride is a lifelong pursuit because horses are individuals. The most basic skill any rider should have and constantly strive to perfect is communication. Observing your horse and learning his or her expressions and body language is the most important part of being a good rider. Work with your horse on the ground a great deal. Become proficient in thorough grooming and hoof care. This will help you and your horse become acquainted, and it will teach your horse to trust you (provided you are trustworthy). If you can give your horse the sense that he or she is always safe when you are around, you will face far fewer challenges when riding. You will be able to handle those challenges that do come up much better if your horse trusts you and believes you are competent. When riding, always look ahead. No matter where you are, never become complacent. Watch out for anything surprising that may come up and startle your horse. This could be a child, cat or dog rushing up unexpectedly. It might be a plastic bag blowing in breeze. Stay alert so that you can take proper precautions in advance to prevent having your horse bolt or shy. Learn to use your hands properly. Keep light contact with your horse’s mouth. Don’t pull back unnecessarily hard on the reins or make sudden, jerky moves. Stay calm and relaxed and convey your wishes to your horse in a gentle and understandable manner. When you do this, your horse will be more responsive. If you do come upon a situation where you need to react quickly to turn or stop your horse, you will be able to. If you haul at the reins and saw at your horse’s mouth when you ride, your horse will not be able to tell the difference between your usual style of riding and urgency. Learn how to redirect your horse. Sometimes a horse just wants to go back to the barn, go see that other horse or otherwise do something you don’t want to do. When this happens, you may need more than your basic “whoa”. Just pulling back on both reins may not stop a determined horse, and he may not want to respond to neck-reining (assuming that he usually does). When this happens, gather up your reins with one hand and slide your other hand down one rein to turn your horse away from the object of his desire. Bring his nose back toward your knee. Press firmly with the opposite calf and thigh to encourage your horse to turn away. Understand that you may need to circle him a few times to convince him that you are in charge and he needs to change his mind. Calmness and consistency are key in any interaction with a horse. Always avoid sudden, unexpected moves, shouting and other activities that may startle your horse. Work with him or her regularly to develop a sound relationship because this is the basis of all riding skill. And join the horse riding association too, to keep you up to date and interested. And if it all gets a bit too much sometimes, then just take some time out and relax with a great horse movie instead. Sometimes you both just need break! 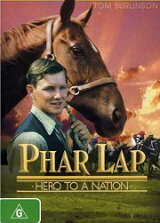 If you are going to watch this 1983 movie, i suggest that you have a box of tissues or even an absorbent towel near as Phar Lap really is a tear jerker. I used to watch this one repeatedly for several times. There is some really good riding in this one and props to the horse handlers who kept it real, but safe. Young Jim Craig, after he lost his father, went to the ‘low country’ and when he try’s to prove himself he ended up getting himself in hot water. Tom Burlinson, who also featured in Phar Lap, is the lead role and does many of his own stunts in this movie which sweeps wats his new employer’s young stallion as well as hos own mare Bess. This is yet another horse racing movie, that is based on Mariah’s Storm career. The race horse suffers a serious injury, but through her owners dedication she returns to win several races. The races that Soñador wins in this film are different from those that Mariah Storm wins, but the movie is overall entertaining. 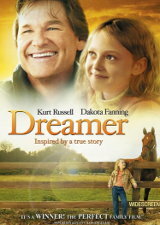 Cale Crane, a character played by Dakota Fanning is a youngster whose dedication makes her father keep faith in Soñador’s potential. This movie was released in 1972 and it actually make you wish for a Morgan stallion as well. Justin Morgan Had a Horse is a movie that tells the story of the first Morgan, which is also known as Figure. Owned by a school teacher, Justin morgan is a film based on the Marguerite Henry’s book. If you love horse stories that make you cry, then you should also have your tissues ready for this one. Although the movie Flicka was remade in 2003, the earlier version released in 1943 is much better. 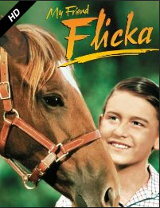 My Friend Flicka is a story of a boy’s love for his horse and it is based on the book My Friend Flicka by Mary O’Hara.